I. The National Constituent Assembly is inaugurated. II. Message from President Ngo Dinh Diem to the National Assembly on the Foundations of the Constitution. 1955, and by the terms of the Provisional Constitution Act, I have the honor to transmit to the National Assembly my viewpoint on the constitutional problem. Numerous constitutions have been drawn up and promulgated in the past with the intention of setting up Democracy. During the 18th and 19th centuries, constitutions were drawn up which established political regimes, later known as political democracies, in which individualism and economic liberalism were advocated as proper formulas to emancipate man and lead mankind toward happiness. While this system in its appreciation brought relative freedom to a minority of its citizens, at the same time it lessened the effectiveness of the state, which became impotent to defend collective interests and to solve social problems. The events preceding the two world wars revealed these weaknesses more than ever before, and, in certain States led to the birth of fascism, which aims at a concentration of powers and a personal dictatorship. On the same pretext of organizing power effectively and achieve social justice, another reaction has been manifested in the form of communism and the so-called popular democracies. At the cost of heavy restrictions and the sacrifice of individual liberties, these systems have merely imposed party dictatorships. Even in the regimes of political democracy which were faithful to the traditional concept of democracy, an important current of ideas has for a number of years led thinkers and jurists to revise the basic notions of modern democracies, as well as their methods and structures. Most democratic states have endeavored, either by constitutional changes or by legislative enactment, to modify their political institutions in important respects. Although they have been diverse, these transformations of Public Law which aim at reconciling the demands of collective discipline and social justice with those of individual liberty reveal a personalistic tendency. In addition to the negative liberties of a political nature, it is recognized that the human person has positive freedoms of an economic and social nature. At the same time the state, organized on a more democratic basis, is given a wider, more stable and more effective grant of power to bring positive assistance to the citizen against the massive dangers of materialistic civilization, and to guarantee him the right to live and exercise his liberties. Viet-Nam welcomes gladly the teaching born of the experience of those democratic states, all the more as it is consistent with the political humanism and the historical situation of Viet-Nam. Placed by its geographical position at the outpost of the Free World, at the confluence of great currents of thought and on one of the great axes of human migration, Viet-Nam is continually exposed to multiple dangers which threaten its political stability. Thus the grave problems which we have to solve now are not transitory or accidental phenomena. The risks of relapsing into anarchy and servitude brought about by the internal feudalism or foreign imperialism that lies in wait for all newly emancipated peoples weigh more heavily on our country than on others, because of our geographic position. This is all the more true since the communism which has been established in the North constitutes a continuing latent menace for South Viet-Nam. Even after reunification, Viet-Nam, located at the nerve center between two great demographic masses, will remain a sensitive zone subject to instability. These, gentlemen, are the present tendencies of public law among free peoples and the constant geopolitical facts of Viet-Nam. It is in light of these experiences, of these realities, and of the tradition of Vietnamese humanism that I invite you to examine the problems of the future political regime of our country. In that which concerns us as Vietnamese, we must increase tenfold the dialectical efforts by which our elders in democracy have tried to smooth the conflict between social justice and liberty for the sake of the human person. Faced with the massive forces of material and political oppression which threaten us constantly, we feel more than other peoples the essential necessity of grounding our political life in a clear cut and solid basis, and to rigorously concentrate the successive stages of our action along the same line towards an increasingly great democratic progress. Such a basis can only be a spiritualist one; such a line, that which the human person follows in his innermost reality as in his community life, in his transcendent vocation as in his free pursuit of intellectual, moral and spiritual perfection. Thus we affirm our faith in the absolute value of the human person, whose dignity antedates society and whose destiny is greater than time. We affirm that the sole legitimate end and object of the State is to protect the fundamental rights of the human person to existence and to the free development of his intellectual, moral and spiritual life. We affirm that democracy is neither material happiness nor the supremacy of numbers. Democracy is essentially a permanent effort to find the right political means for assuring to all citizens the right of free development and of maximum initiative, responsibility, and spiritual life. 2) Citizens are born free and equal before the law. The State should assure them equal conditions for the exercise of their rights and the accomplishment of their duties. It owes aid and protection to the family so that harmonious family life can develop. Citizens have a right to a secure and peaceful life, to justify remunerated work, to sufficient individual property to assure a dignified and free life, to democratic freedoms, and to the full development of their personalities. They have the duty of developing the national heritage for the Common Good and for universal peace, of safeguarding freedom and democracy, of defending the Nation and the Republic against all those who seek to destroy the foundation of the common life and the Constitution. 3) Sovereignty belongs to the people. The elected National Assembly is vested with legislative competence. The President of the Republic, also elected by universal, direct and secret ballot is vested with executive competence. The family vote is admitted, and the voting rights and eligibility of women is recognized. The separation of powers should be clear and the responsibilities of the different organs of the State well defined, and their activities well coordinated to assure a maximum of stability and efficiency. A High Court of Justice will be established to decide cases of high treason. 4) The judiciary should be independent in order to make an efficacious contribution to the defense of the Republic, of order, of freedom and of Democracy. 5) A Supreme Court should be organized for the control of the constitutionality of laws. 6) Economic forces should associate in the exercise of power in the form of a National Economic Council composed of representatives of union and professional groups and which will present suggestions and opinions on bills of economic interest. Ladies and Gentlemen, the constitutional principles which have just been outlined are intended to guarantee to the individual the full development of his capacities, and to the state a harmonious and fruitful functioning of its organs by means of the correct working of concerted actions and reciprocal control. You are to decide upon a question of major interest to the Nation. 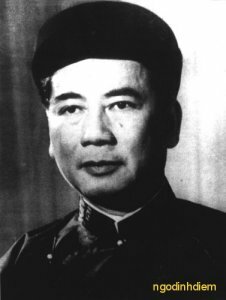 On the solution that you will have chosen will depend the future and the prosperity of Viet-Nam. I am convinced that you will succeed in this historic mission.